Olive drab with gold stenciling and blue, red, white and gold U.S. Army Air Corps logo. This F7 A-unit features WWII nose art called “Sentimental Journey” with a rendering of the iconic Betty Grable. The road number 1945 was the year “The Big One” ended. F7A • $129.95 retail ea. Paitned UP Yellow with red horizontal stripes flanking the yellow bands. The roofs and ends are painted gray. Lettering is red and outlined in black. 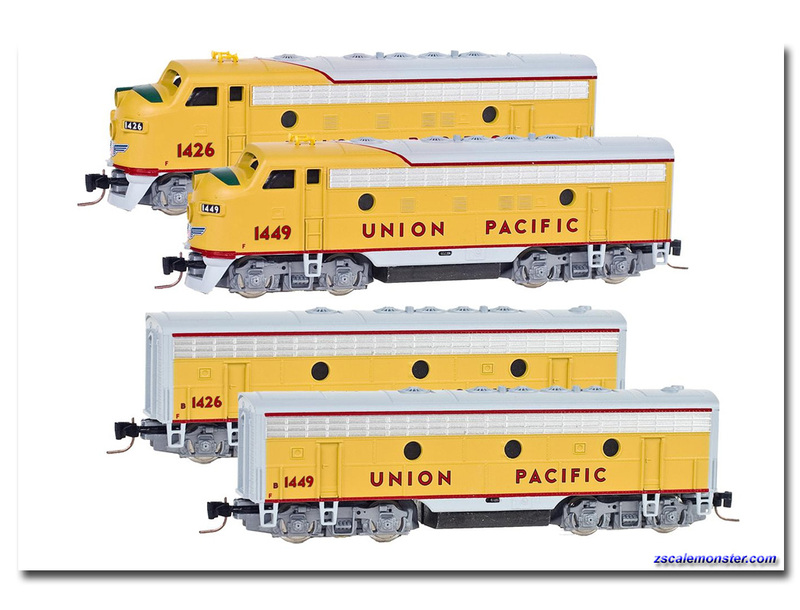 These exciting releases represent the livery of the multi-colored Union Pacific F-Series locomotives. Equipped with Blomberg trucks, many of these 1951 UP units joined the immense F3 fleet and some of the F3s, including these locos, were improved to F7 standards. These powered F7A and powered F7B units were built by Electro Motive Division (EMD) and are painted Tuscan Red with buff lettering. Pennsylvania began acquiring F7’s between mid-1949 and 1952. Their F7 fleet was used in both mainline passenger service and later on priority freights. Most units survived over 20 years, continuing into the Penn-Central merger. F7A • $109.95 retail ea. F7B • $94.95 retail ea. 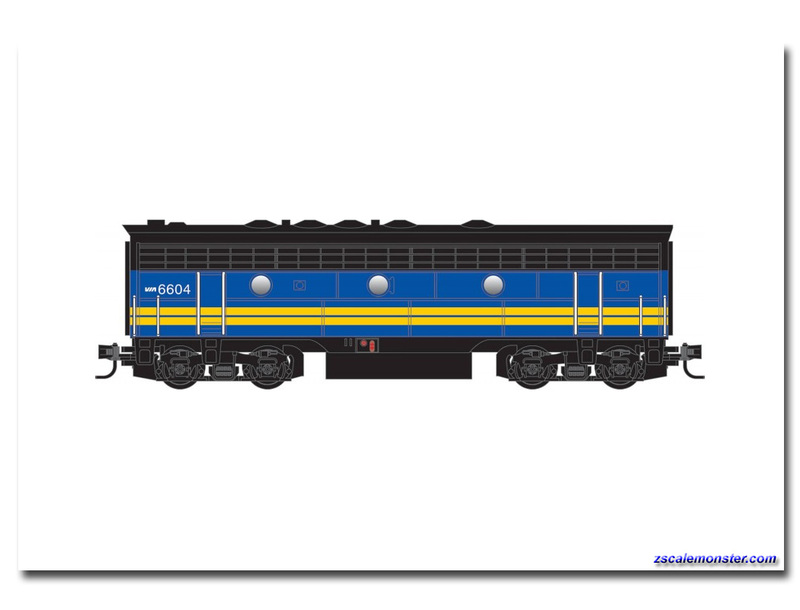 These locos were built in 1949-1952 by Electro Motive Division (EMD). They are painted black with gray lightning stripes. Promoting itself as the ‘Water Level Route, NYC added 238 F-7 freight cabs during this time. They were powered by 4,500 HP 567 EMD diesel engines. 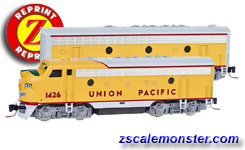 These A and B unit F7 locomotives...The Southern Pacific, now the Union Pacific, was one of the largest railroads in the U.S., ranking third only behind Pennsylvania and New York Central in operating revenue and second behind Santa Fe in route mileage, with over 11,000 miles of railway from Chicago, south to New Orleans, and west to San Francisco and Portland, OR. The Union Pacific & Southern Pacific merged Sept. 11, 1996. 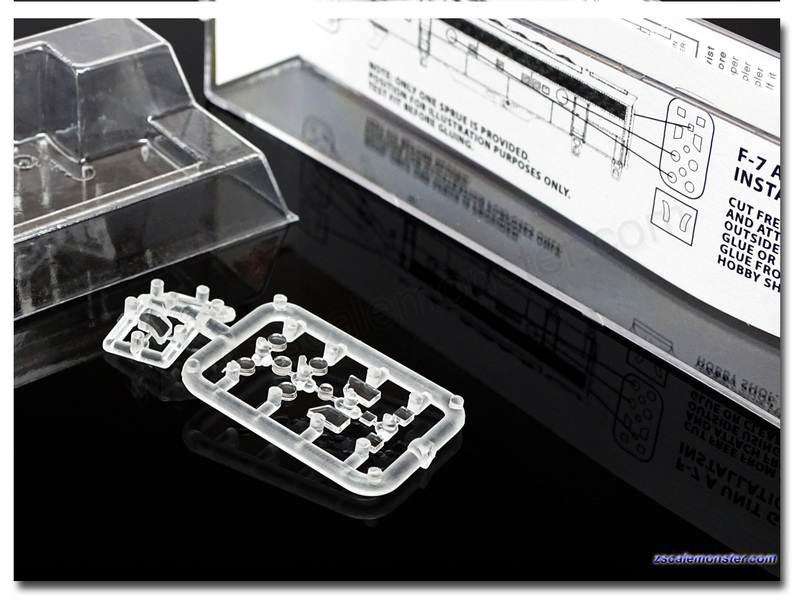 F7A • $99.95 retail ea. Pennsy acquired 116 F7As and 76 F7Bs between mid-1949 and early '52. The units were not sequentially numbered as purchased. Passenger was handled by the maroon painted F7s, while the Brunswick Green F7s pulled freight. 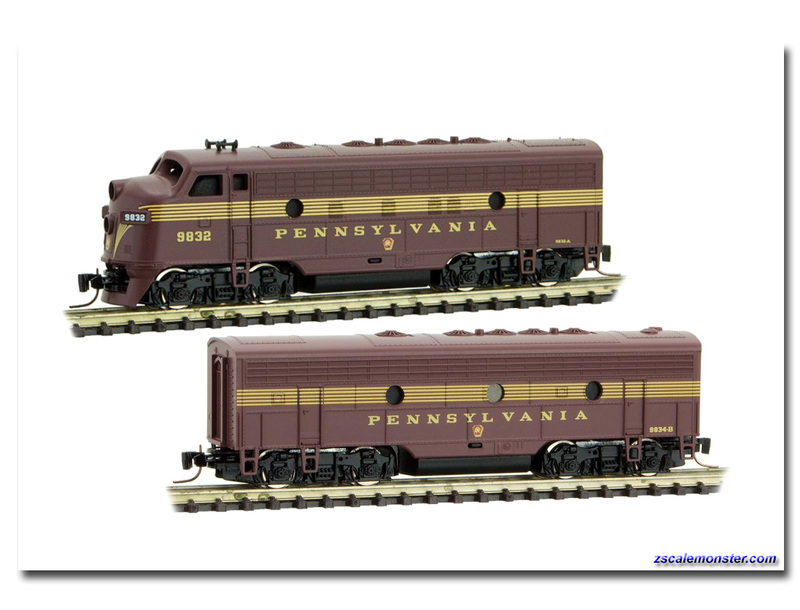 The lettering and the single stripe is buff with the PRR keystone in red and buff. The Pennsy fleet of F7s handled the preference freights giving 20 years of service, with some units passing into the Penn Central merger. 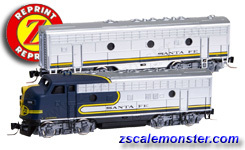 These ATSF powered F7A and powered F7B units were built by General Motors EMD in 1951. 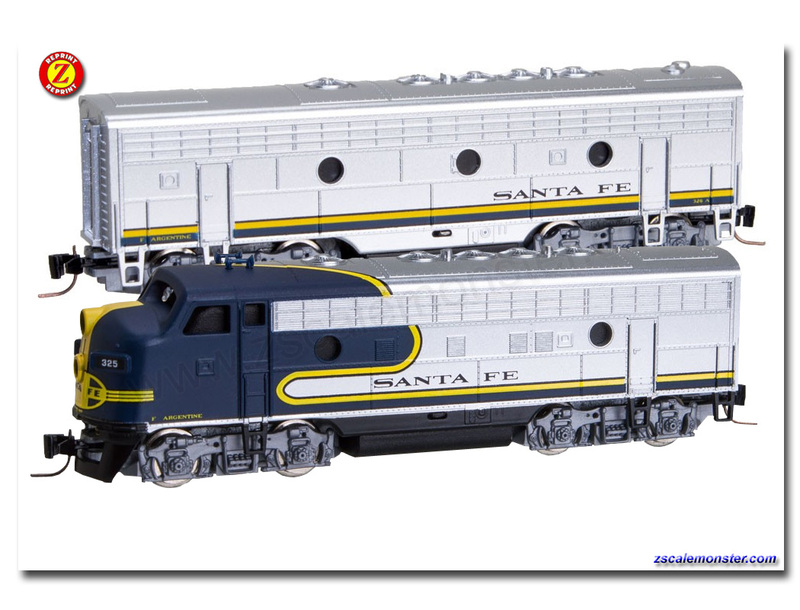 After Amtrak began operation in 1971, Santa Fe reassigned some of the dual-purpose F7’s to freight service only. 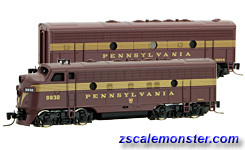 They were repainted in a blue version of the Red Warbonnet scheme. In 1977 these units were rebuilt as CF7 hoods. These F7 A & B units are painted tuscan red with a grey band and nose. 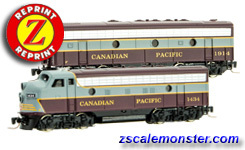 Built in the early 1950s, these EMD locomotives were used on Canadian Pacific passenger trains. Founded in 1881 and headquartered in Calgary, Alberta, Canadian Pacific owns approximately 14,000 miles of track all across Canada and into the United States. 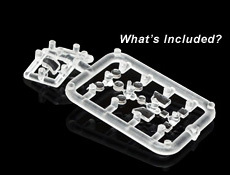 F7B • $99.95 retail ea. Built by GMD as FP7A 4099 in 1953, This F7 was renumbered to CP 1400 in 1954. 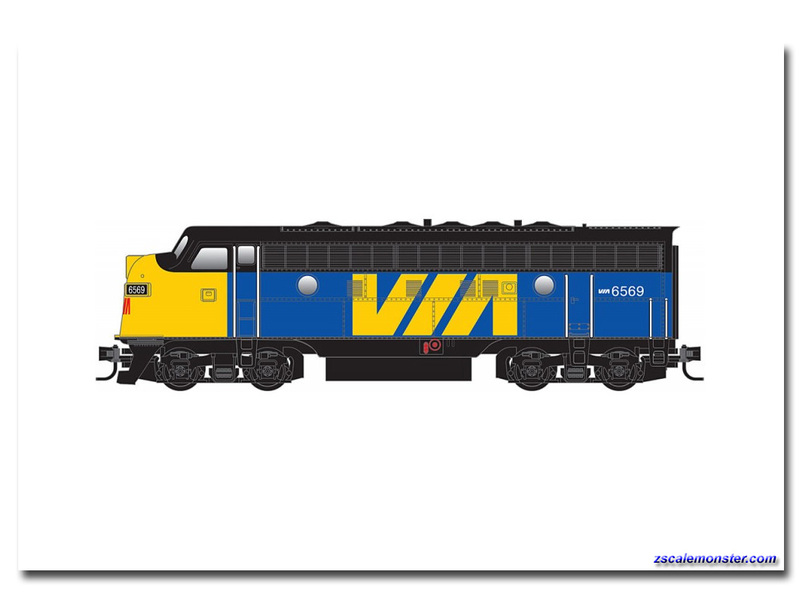 Sold to VIA Rail Canada (Canadian National’s passenger subsidiary) in 1978, she became VIA 1400, then was renumbered to VIA 6550 in 1981. She was sold to Nebkota Railway in 1994, and renumbered 55. 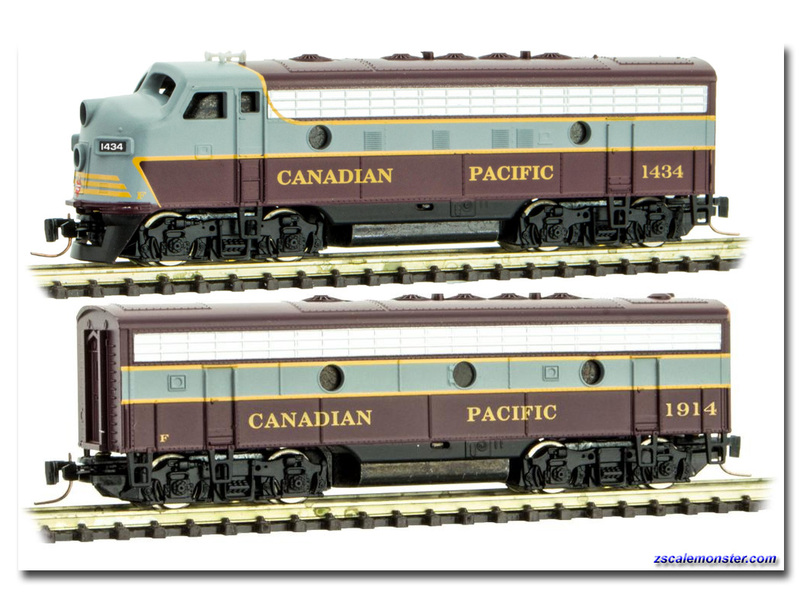 Canadian Pacific repatriated her in 1998, and repainted into the 1950’s Maroon/Grey paint scheme and numbered CP 1400. 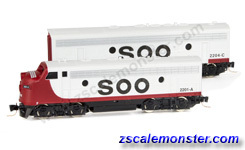 These powered F7A and B unit locomotives are painted dark gray with the SP red ‘Bloody Nose’ paint scheme and lettered in white. Built in 1953 these units stayed with the SP line for their entire working life. In 1959, SP standardized with a paint scheme of dark grey, white lettering and a red ‘winged’ nose. this scheme was dubbed ‘Bloody Nose’ by railfans. It was replaced in the mid 1980s by the ‘Kodachrome’ paint scheme. F7A • $134.95 retail ea. These powered F-7 A and B unit locomotives were built in October 1952 and June 1951, respectively. They were both rebuilt in June 1973 when they received the zebra paint scheme. The B unit was retired in 1988 and the A unit retired in 1989. The EMD F-7 was a 1,500 horsepower (1,100kW) diesel-electric locomotive produced between February 1949 and December 1953 by the Electro-Motive Division of General Motors and General Motors Diesel. A total of 2,366 cab-equipped lead A units and 1,483 cabless booster B units were built. 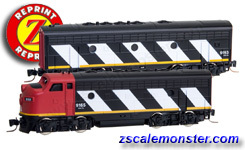 These F7 A and B unit locomotives are painted black with red bands and white stripes. 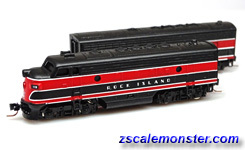 The Rock Island lettering is white with the white and red ‘beaver pelt’ shields on the A units’ noses. They were built for Rock Island in May 1959 from EMD order number E972-A. These F7s likely started their work on the rails paired with similarly numbered A and B unit pairs. F7B • $49.95 retail ea. 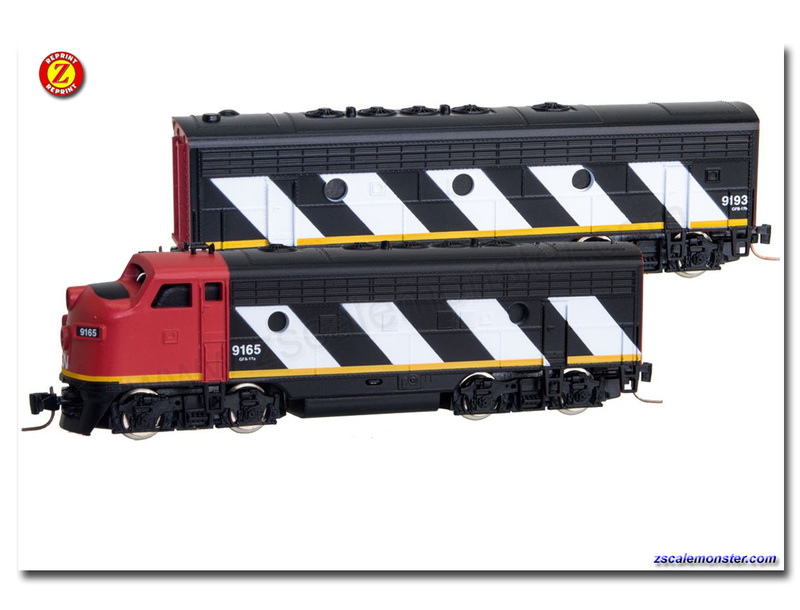 These F7 A and B unit locomotives are painted Imitation Aluminum with red bands and black stripes. The sides bear “Burlington” in black. They were built in May 1950 by as part of order 3058-A for CB&Q. These “grayback” locos were generally paired with similarly numbered A units produced at the same time. 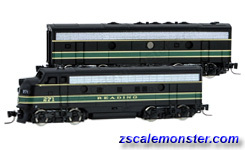 These Western Maryland F7 locos are painted black with yellow stripe and ‘Western Maryland’ lettering. Both were built in 1952 by EMD. F7 ‘A’ unit was part of order #3068-A. It was later renumbered to 7172 and turned in to EMD in 1977. 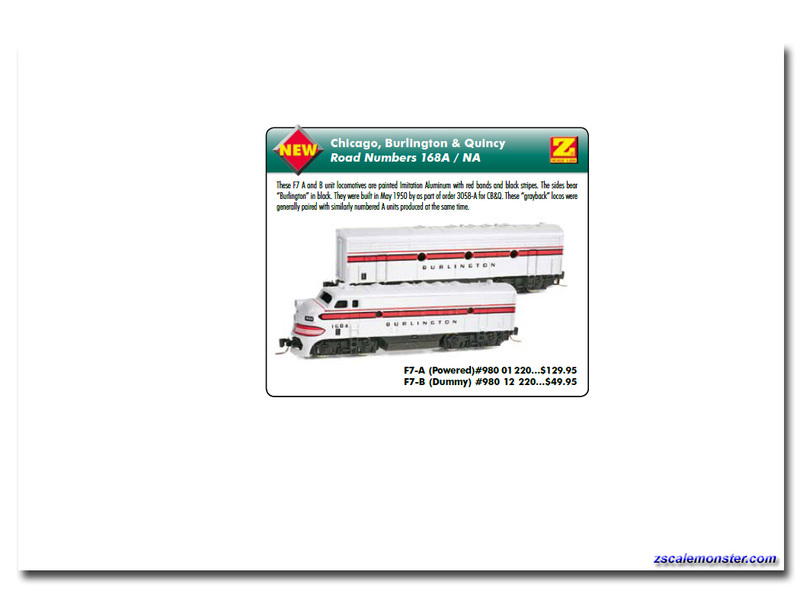 F7 ‘B’ unit was part of order #3068-B and first numbered 235B. Sometime later it was renumbered to 7142 and turned in to EMD in 1978. 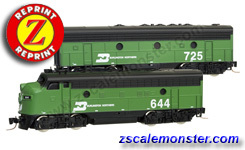 These BN powered F7A and powered F7B units are both painted green and black with white logos and lettering. They were built by EMD, Electro-Motive Diesel owned by Caterpillar through its subsidiary Progress Rail Services Corporation. The A-unit was built in February 1950 and the B-unit was built in May 1951. 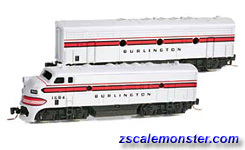 In 1970 Northern Pacifi c, Chicago, Burlington & Quincy, and other lines were merged to form the Burlington Northern. 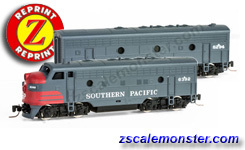 These A- and B-unit locomotives are painted blue and bear the red and white ‘buzz saw’ logos of Missouri Pacific.’ These locos were built in May 1950 and May 1951, respectively, by EMD for Missouri Pacific. 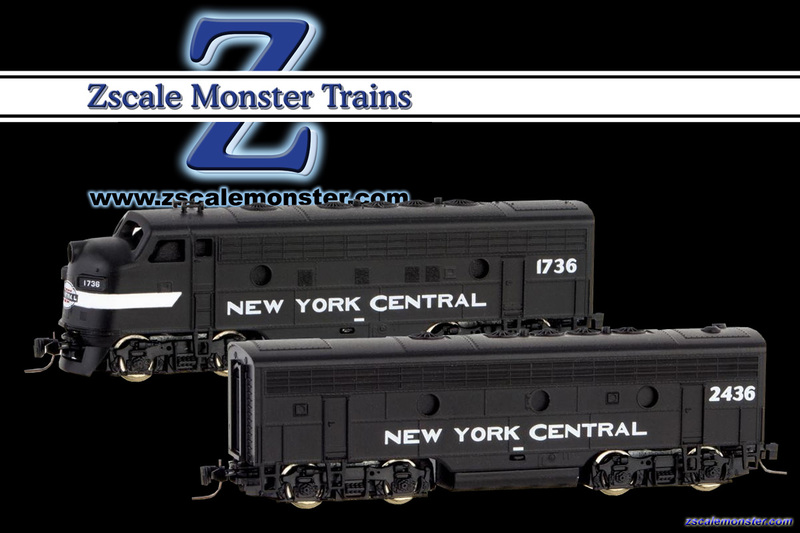 At one time the Penn Central & Erie Lackawanna rosted a large number of F7As, by the time Conrail was formed only a hodge-podge of units survived. Being old and worn out, most F7As found themselves retired & cut up quickly. The EMD F7 was a 1,500 horsepower (1,100 kW) Diesel-electric locomotive produced between 2/1949 & 12/1953 by the EMD & GMD. A total of 2,366 cab-equipped lead A-units & 1,483 cabless booster or B-units were built. 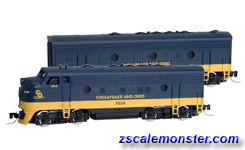 These EMD F7 A and B units are painted aluminum in a yellow ‘Warbonnet’ scheme with blue on the nose, blue lettering and herald, and black and red ‘Hiawatha’ logo. 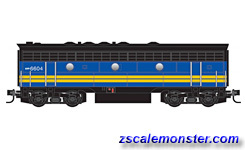 The EMD F7 was a 1,500 horsepower (1,100 kW) Diesel-electric locomotive produced between February 1949 and December 1953 by the Electro-Motive Division of General Motors (EMD) and General Motors Diesel (GMD). A total of 2,366 cab-equipped lead A-units and 1,483 cabless booster or B-units were built. 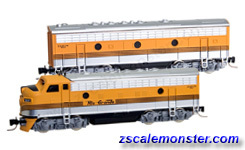 The dark green F7 A unit locomotives are lettered and striped in orange. By 1982, the two remaining F’s were demoted to “B-unit” status because of their older, obsolete brake system. In September of 1984, several of the founding members of the Feather River Rail Society acquired their first acquisition, Western Pacific F7 #921, housed in the old WP Diesel shop in Portola, now a world class railroad museum. Blue w/ yellow lettering and stripe on the sides. The “A” unit features the B&O capital dome logo painted yellow on the nose. 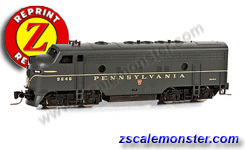 The EMD F7 was a 1,500 horsepower (1,100 kW) Diesel-electric locomotive produced between 1949 and 1953 by the Electro-Motive Division of General Motors (EMD) and General Motors Diesel (GMD). A total of 2,366 cab-equipped lead A-units and 1,483 cabless booster or B-units were built. ∗Overstock Sale! 30% off when you buy both! Red w/ black roof & yellow lettering & logos; built by EMD in 1950. The Kansas City Southern Railway Company (KCS) is the smallest and 2nd-oldest Class I railroad still in operation. KCS, founded 1887, is currently operating in a region consisting of 10 central U.S. states. 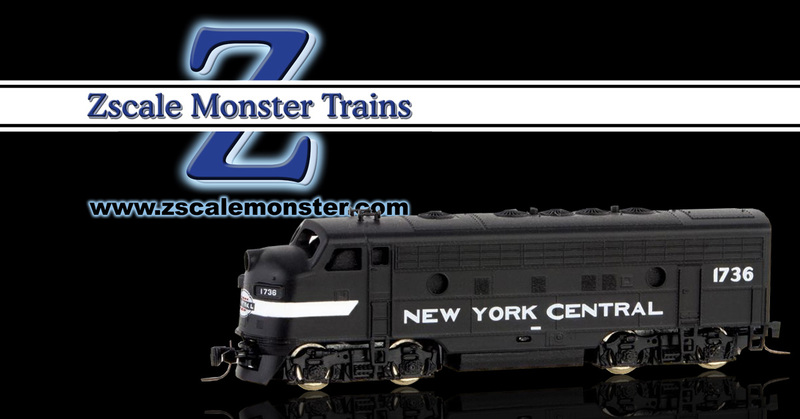 KCS also owns and indirectly operates Kansas City Southern de México (KCSM) in the central and northeastern states of México, and is the only Class I Railroad to own trackage both inside and outside of Mexico’s boundaries. Buy the KCS Set and save! Painted grey w/ Large “Seaboard System” letters and Chevron Stripes. The Seaboard System Railroad, Inc. (reporting mark SBD) was a short-lived former US Class I railroad that was created after the consolidation of the Family Lines System railroads; July 1, 1986, the Seaboard System renamed itself as the CSX Transportation and absorbed the Chesapeake & Ohio Railway on August 31, 1987 which ended the CSX Corporation’s shared ownership of the SBD and Chessie System railroads. F7A • $119.95 retail ea. Painted blue with white stripe and grey roof. 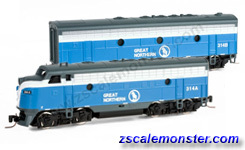 Built in 1952, GN 314A was originally ordered for iron ore road service on the Mesabi Division out of Superior, Wis. The Big Sky Blue scheme, less than 3 years old, would give way to Cascade green in less than 90 days, although it would take BN until 1980 to paint all their locomotives. 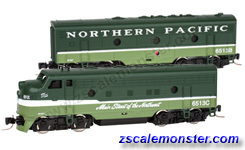 These NP powered F7A and powered F7B units are built by General Motors EMD and are painted in the well-known two-tone green scheme. NP assembled their F locos in three-unit sets for passenger service and fourunit sets for freight service. 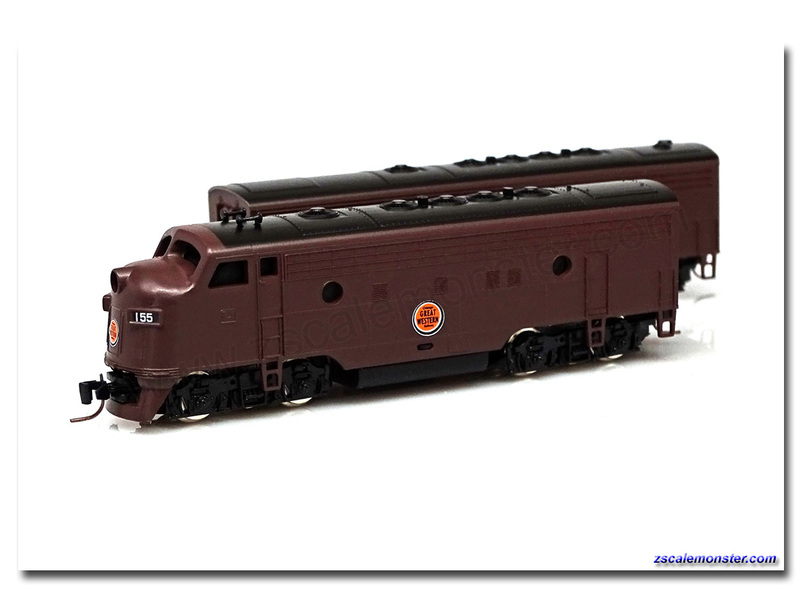 These SOO Line powered F7A and SOO Line powered F7B units were built in 1949 and originally painted maroon and gold. In 1964 they were repainted in the red and white scheme as represented here. 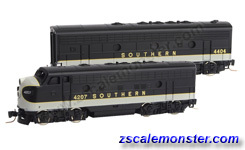 These Southern Railroad powered F7As and powered F7Bs wear the ‘Tuxedo’ paint scheme. Built by EMD the F7 was originally promoted as a freight hauling unit, they were also used in passenger service. Southern pulled its remaining F-units from regular service on the Appalachia Division in the fall of 1969. 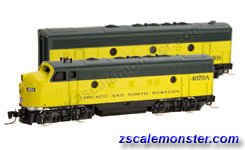 CNW began painting F-units in the simplifi ed yellow/green with “Chicago and North Western” spelled out on the flanks and nose shields by 1961. The engines retained their four digit 4000 series numbers until 1971-72 when the remaining F-units that hadn’t been traded in on newer units were numbered into the 200 series for A units and the 300 series for B units with CNW heralds on the nose and sides in simplifi ed yellow/green. Units painted in the original black/yellow/green scheme could be found still in the late 60s. These Denver & Rio Grande Western powered F7As and powered F7Bs wear Aspen gold paint with aluminum roofs and bear the four black stripe paint known by some as the ‘Prospector scheme’. 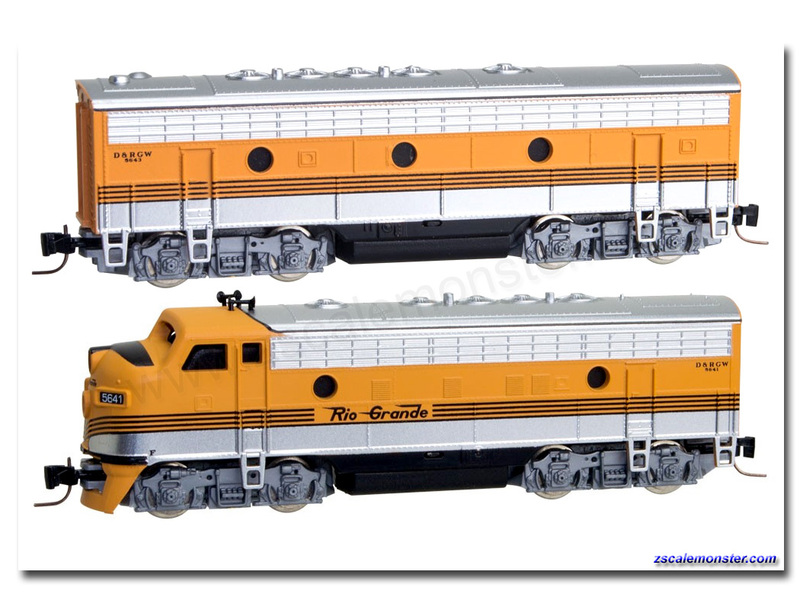 In 1952, Denver & Rio Grande Western received 14 A units and 12 B units painted in this scheme. These powered F7A and powered F7B units were built by Electro Motive Division (EMD) between 1949 and 1953. 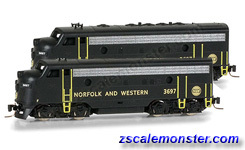 These locomotives were promoted as a freight-hauling unit; powered by 4,500 HP 567 EMD diesel engines. 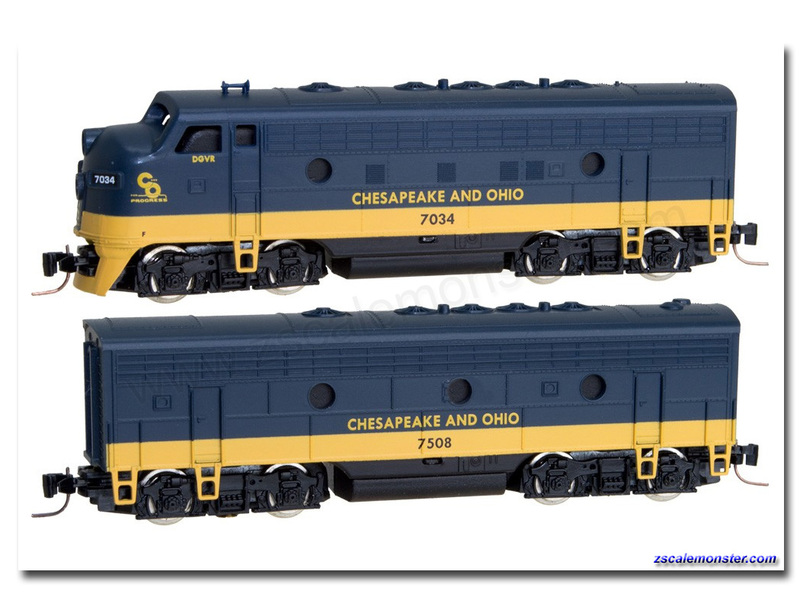 Chesapeake & Ohio purchased 148 new F7 units during the height of the dieselization of American railroads. 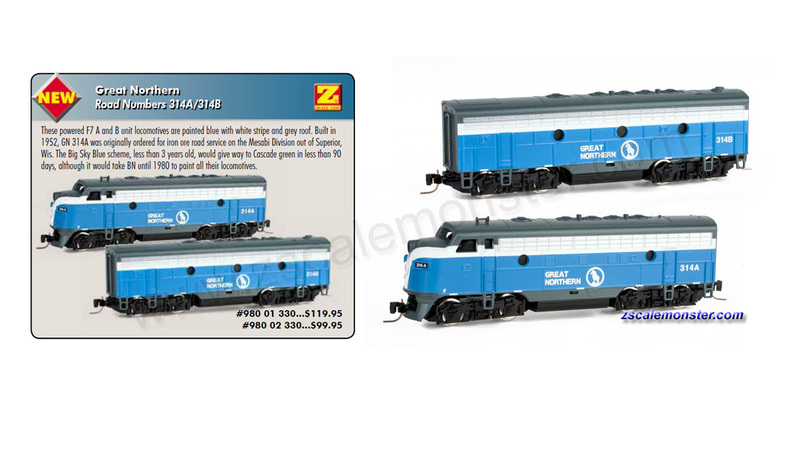 These powered F7A and powered F7B units were built by Electro Motive Division (EMD). These locomotives were built as part of Reading’s final diesel freight cab units. 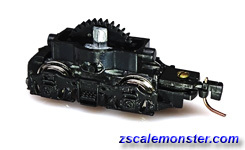 Painted black with green band an yellow stripe, this order was split between A and A-B units. These powered F7A and powered F7B units were built by Electro Motive Division (EMD) between 1949 and 1953. 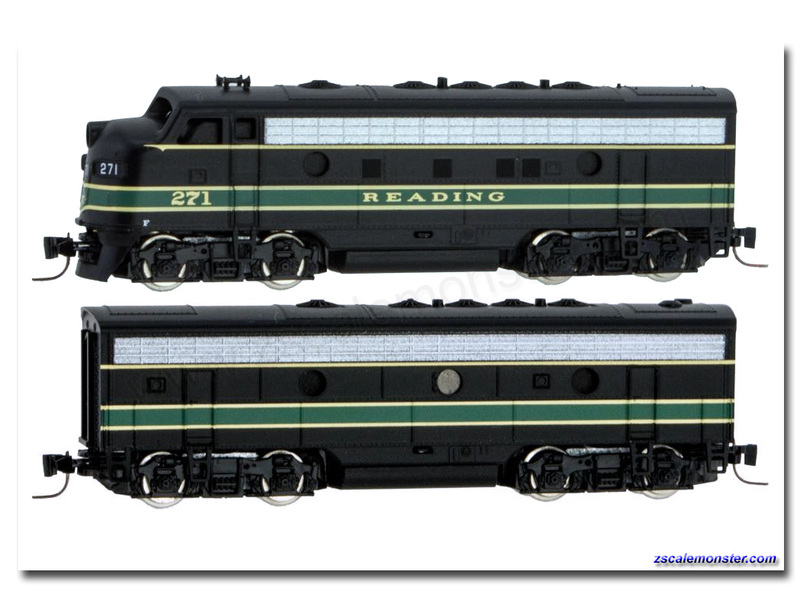 These locomotives were built as part of a 36 unit order in 1950. 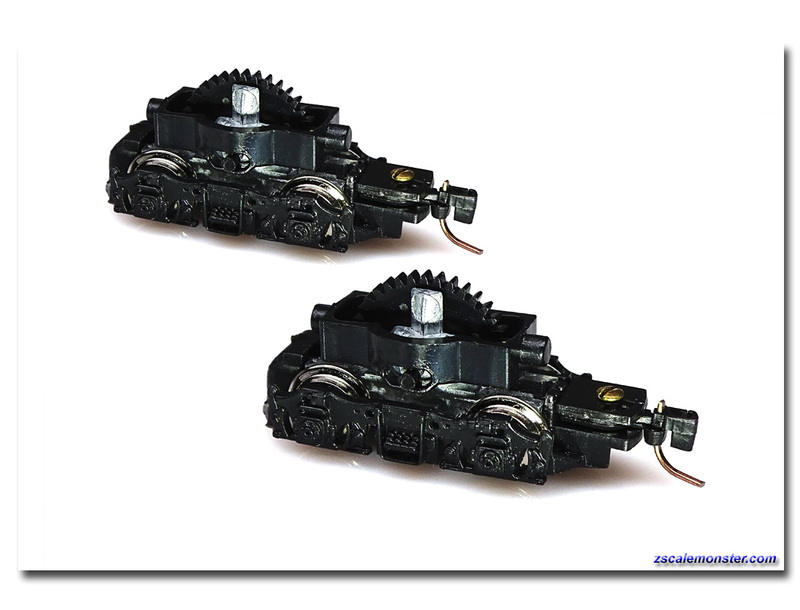 They are painted aluminum with orange sides and nose with black roofs. 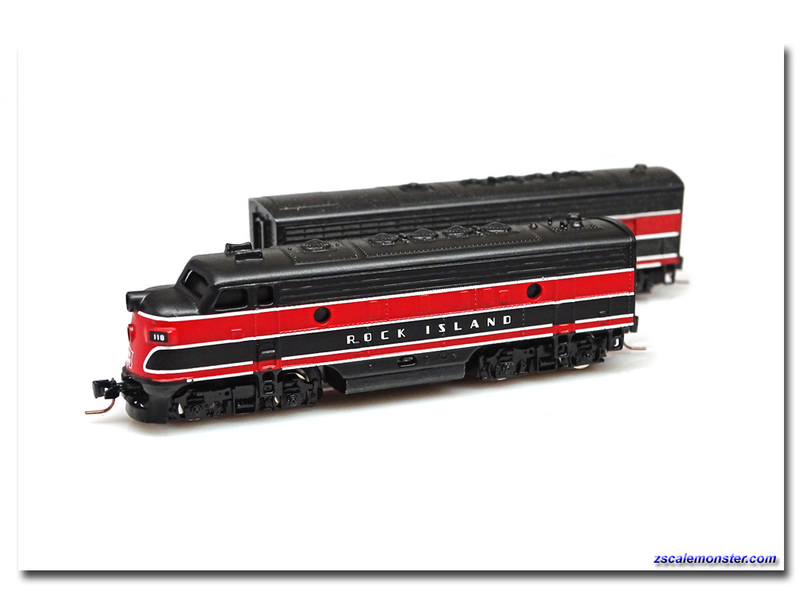 The nose carries the Feather River Route herald and the sides are lettered in black. 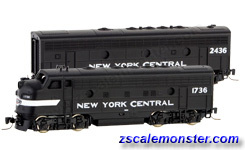 These powered F7A and powered F7B units were built by Electro Motive Division (EMD) in 1949. 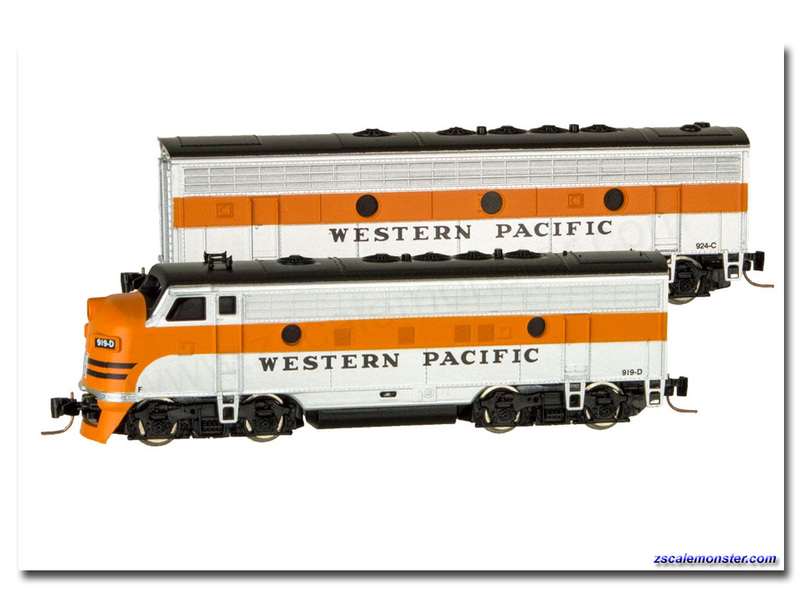 These locomotives were used to haul freight during the height of the dieselization of American railroads. They are painted black with a white band on the nose and white lettering. 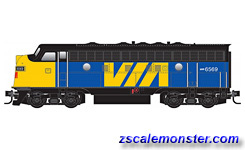 Via Rail Canada is an independent, state-owned company of the Canadian Government and is the largest passenger rail service in Canada with nearly 8,000 miles of track across eight provinces. Via Rail runs both long-distance and commuter services, and replaced passenger rail services offered by both CN and CP. 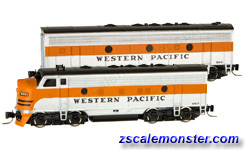 Our 4-pack features three coach cars and our all-new modernized heavyweight business car. Did you Pre Order w/ $17.59 down? F7A • $108.85 retail ea. These locos were built in 1949-1952 by Electro Motive Division (EMD). They were powered by 4,500 HP 567 EMD diesel engines.